The global marketplace is on the cusp of an unprecedented disruption. A social movement for good has shifted from the margins to the mainstream. The great news is that leaders who have the foresight to innovate for the coming Conscience Economy are poised for explosive growth. 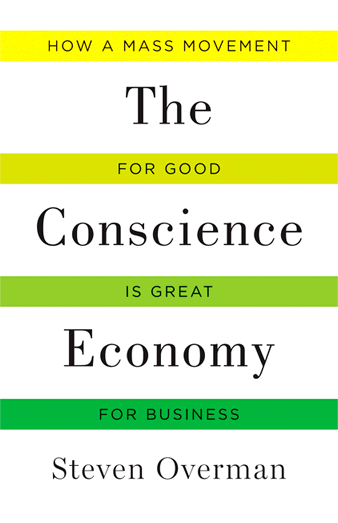 In his new book, THE CONSCIENCE ECONOMY: How a Mass Movement for Good is Good for Business, Steven Overman offers a big picture look at the emerging Conscience Economy, its drivers and how businesses must adapt to survive and succeed - from rethinking marketing and CSR efforts, to embracing accountability and new cultural norms. With examples ranging from TOMS Shoes to One Water and Whole Foods, and practical insights throughout, Overman equips individuals, organizations and brands with the necessary tools to make goodness the driver of their bottom line. To book Steven for your next event, contact Bibliomotion here.